Happy Canada Day ! Why does Google hate Canada Day? Today Canadians are celebrating the 144th birthday of Canada. I wish everybody a very happy Canada Day! Newly married British royal couple, Prince William and Kate Middleton who arrived in Canada yesterday, took part in the Canada Day celebration. Prince William also addressed Canada Day crowd in Ottawa. Why does Google hate Canada Day? I don’t know the answer to this question. But, it is now clear that Google has grown the dislike of Canada Day, for some unspecified reasons. I have two good reasons to believe that Google hates the day. Until 2008, Google used to design it’s Google Doodle (Google Logo) to honor Canada Day. Starting 2001 Google had started displaying the Canada Day logo on every July 1. But, it stopped the practice abruptly in 2008. The Cannucks weren’t happy on the Google decision. 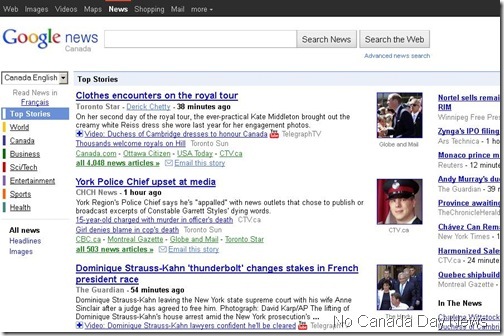 Reason 2 – Today, on July 1 of 2011, when I checked the “Canadian Version” of Google News, there were no news mentioning Canada Day! What a surprise? Yes, Google doesn’t write news, but it is surprising no newspaper Google syndicate talk about the country’s birthday. Do you know of any particular reason Google might be upset of the Canada Day? Or, is there no Canada Day in Google calendar? This entry was posted in Love n Life and tagged Canada Day. Bookmark the permalink.